The Club's bi-monthly newsletter is available to every member and has information on future Club meetings, field trips and activities as well as outside events of interest to members. There is also a write up of previous meetings and activities attended by the Club as well as members' articles on various aspects of nature. In 2009, members were asked to submit images for inclusion in the Club's first calendar published for 2010. Titled Tasmania's Spectacular Natural History the calendar was very popular, being purchased by members for themselves and as gifts for relatives and friends. In both 2013 and 2014, there were two seperate A5 sized calendars available due to the quantity and quality of images submitted. Between 2015 and 2018, the calendar produced has been A4 sized. They were professionally printed on quality paper and spiral bound by John Temple Gallery in Westbury. A 2019 calendar was not published due to the revision of the Club's book. Thanks to the foresight and tireless efforts of the late John Simmons and his wife Marion, this phenomenally successful guide has been available to bush walkers, tourists and others to identify Tasmanian flora since 1981. The late Mary Cameron an eminent botanist and club member played a leading role in the production of the guide and edited the first three editions. Club members have continued to improve and update the book on a regular basis, with technical assistance from staff at the Tasmanian Herbarium. Now in its fifth edition, this beautifully illustrated guide has been extensively revised, with additional species, updated text and many new pictures. For ease of identification each of the 300 species described is illustrated by one or more photographs. The text includes all information necessary to help identify the plants: size, description, flowering time, appearance of the flowers and other parts of the plant, and the type of habitat where you may expect to find them. The book also includes an introduction to the vegetation of Tasmania, diagrams of leaf shapes and the parts of a flower, and a glossary of common terms. 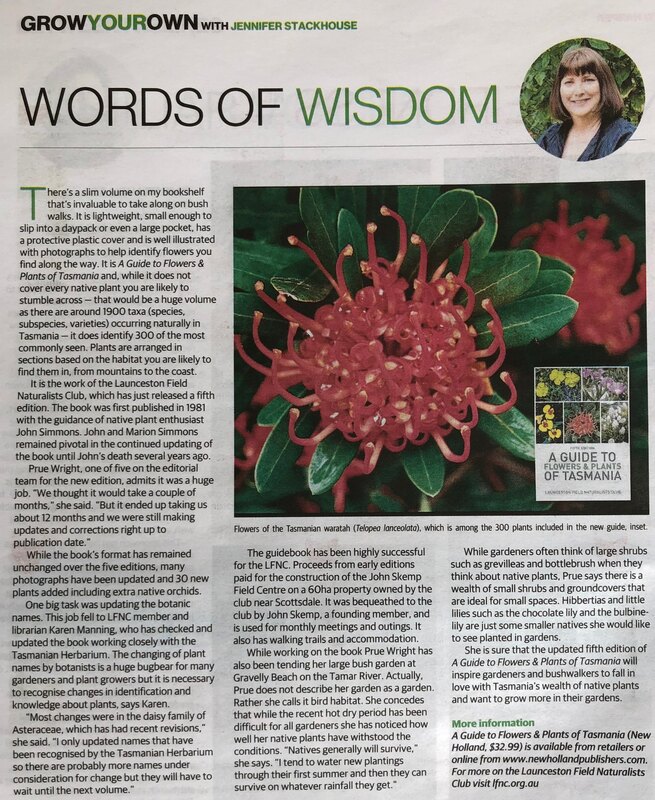 A review of the guide by Peter Dowde appeared in the March 2019 edition of Eucryphia, the newsletter of the Australian Plants Society Tasmania. An article was also in the Mercury's magazine tasweekend by Jennifer Stackhouse, March 16 -17. The book is available from all leading bookstores or on application from the Club. Royalties from the Guide have financed the establishment of the John Skemp Field Centre on the Club's property at Myrtle Bank.